Clematis 'Prince Charles' completely covers itself with a profusion of nodding, pale mauve-blue flowers with a satin-like sheen to the petals and green centres from June to September. This non-evergreen climber is perfect for growing within the flower border, allowed to scramble up a large rose, shrub or tree, covering walls and fences or trained on a free standing obelisk, or in a container on the patio. The delicately coloured flowers would make it a very pretty variety to grown within a cottage garden. Clematis 'Prince Charles' was raised from a seedling given to Alister Keay of New Zealand Clematis Nurseries, Christchurch. 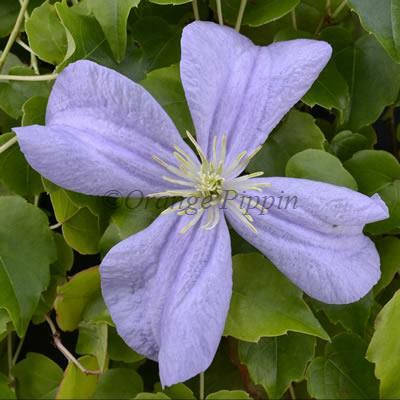 It was introduced into the UK in 1986 by Jim Fisk of Fisk's Clematis Nursery, Suffolk, England.